A garden is a living, breathing thing of beauty, joy and grace. Inspiration comes when I quietly observe the garden with the same respect I would a dear friend. In the stillness, gentle nudges come to mind as to how I may help out here and there. My hands suddenly find themselves busily at work at a steady, peaceful pace. Like most gardeners, it's almost impossible to sit still and just observe for very long. Creative ideas surface rather quickly stirring me to action. Our backyard is proof. You don't need a green thumb to co-create with nature. It only takes a little willingness and a lot of love. Our over-sized lot, edged by shaded tall hardwoods, would still be barren if I hadn't joined hearts and hands with nature. Once the commitment was made to beautify the land, LOVE came pouring in without my asking. Generous friends showed up with extras, rescue flowers popped up at garden centers, and nature seeded "volunteers" that would appear as a treat, often in the most unusual spots. There is also an abundance in nature as the beautiful flowers and plants -- bromeliads, lilies, irises, and ferns have richly multiplied over the years. Nature is a hearty (hardy) giver with her bursts of enthusiasm that can even break through cement when given a tiny crack. My favorite garden quote came to me many years ago by surprise. Weathered and nicked the little flowered garden plaque caught my eye at the cash register at a nursery center: FAITH GROWS IN A GARDEN, I read the sign and felt its power. The sales clerk was surprised I wanted the old chipped thing, and agreed to sell it to me. I knew it was meant to be as I was new to gardening and welcomed the powerful reminder. It takes faith to plant a tiny hard seed. To believe that something beautiful will grow from nothing special. To patiently tend to the soil when there is no sign of growth. All the mystery is hard at work below the surface, unseen, but actively laboring for a higher purpose. Then, to our delight, one day our faith is rewarded. A little green shoot peeks out in the sunshine, eager to rise up and bloom. Nature seems to smile... Because you were faithful with the unseen, now your work begins on a new level. 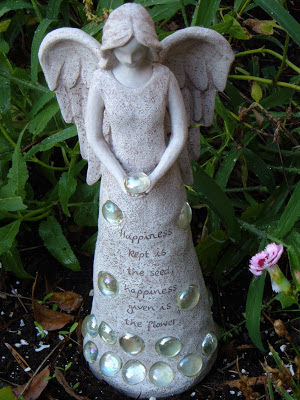 This little angel holds a seed: "Happiness kept is the seed, happiness given is the flower." Many lessons are learned in the garden. Acceptance of the natural cycles of material life. When to plant, when to prune, when to harvest. All in due season. "Physical forms" transition, but the eternal substance of Life is forever.